Jai Howe is one of those rarities - a two-times Wurzels. He first joined the band in the mid-1980s; I have been unable to find a more exact date than that. He replaced Tony Baylis, long-time bass player who had been part of the highly successful Banner-Bayliss-Budd line-up which had topped the charts in the mid-1970s. Although he left not long after (again, exact date unrecorded), he returned towards the end of 2002 when he replaced Dave Wintour. He left the band for the second time in 2007 for health reasons. Jai was born John Howe in Torquay, Devon, and brought up in the nearby village of Hele. After leaving school, he started work as an apprentice in a locksmith. He had several jobs, working at Littlewoods, and for a while working at a company in Newton Abbot which specialised in precision engineering for the medical industry - making joints for artificial limbs. But it was music that was his first love, and work was always a means to the end of playing in bands. Jai's first band was a skiffle outfit at school. Short of a bass player (as this skiffle, we are talking a tea chest with a broom handle in it! ), Jai was offer the chance to play and has never looked back. His early bands started with skiffle, moving onto covers of the popular music of the time - The Shadows, and later The Beatles. Then came The Ventures, not the American surf band, but still a local band of some renown - gigging around the clubs and pubs of Torquay and the village halls of Devon. It was drummer John Morgan who eventually offered Jai his first big break as the bass player in the house band at John's nightclub The Riverside in Exeter (the former King's Hall, St Thomas). The hours were long, and the pay tight, but it was a job as a professional musician, and that suited Jai! He continued to work with John at the influential Dolphin Nightclub in Gloucester - at this venue could attract the top names on the circuit including Adge Cutler & The Wurzels who regularly headlined - and in cabaret in Blackpool. Jai then returned to the West Country to team up with John's bother Les Morgan in his soft rock band Mavis. After that he worked with keyboard player Terry Pascoe (also later to become a Wurzel) back at The Riverside in Exeter, and later the Rainbow Variety Club in Swansea, before teaming back up with John Morgan in a Country and Western band in the early 1980s. 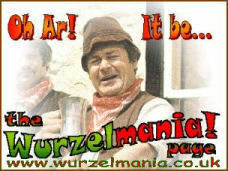 John was now playing with The Wurzels, and when Tony Baylis announced his departure, John suggested that Jai take over. One successful audition later, and Jai was a Wurzel. He lasted about three years with the band before leaving, only to rejoin again in 2002. Interviewed in 2004 for Mervyn Hancock's book Wurzels World, Jai (then 57) hoped that this was a job that would last him for the rest of his life. Sadly that wasn't to be, and in 2007 he left the band for a second time, due to ill health. That illness turned out to be inoperable brain cancer, and sadly on Thursday the 5th of February 2008, John 'Jai' Howe died at his home in Swansea surrounded by close friends and family aged 60.